In Brownsville, as in many other places, they have a well-known road ghost legend, but this one might be the most unique road ghost story you have ever heard. You see, in Brownsville there is a fairly well-travelled farm road called Farm Road 511, and while it seems to be a perfectly normal road by the light of day, the locals warn of traveling it late at night, lest you encounter the road's ghostly inhabitants. 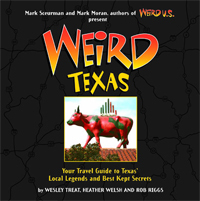 They say that as you drive down certain dark and desolate stretches of 511, your headlights may suddenly wash over a large cow standing RIGHT in the middle of the road, not six feet ahead of your bumper. That's right––a ghostly cow! You may swerve or pull off the road to avoid it, risking an accident, only to look back out at the road to see that nothing whatsoever is there. Some people have even gotten out of their cars and searched up and down the road, only to find no sign of any cows or anything else, living or dead. 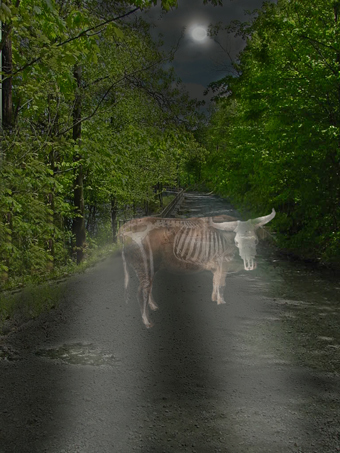 So many ghost cow sightings and resulting car accidents have occurred on this road that the local newspaper and other media have reported on the story. It almost sounds kind of humorous, until you realize that accidents have been caused, so there is the potential for someone to get hurt or even killed in these inexplicable encounters. So, if you ever find yourself traveling down Brownsville's Farm Road 511 in the dead of night, beware of the bovine specters that are said to lurk just around the next dark curve in the road, waiting to claim their next victim.